The White, originally uploaded by ZackTwin. 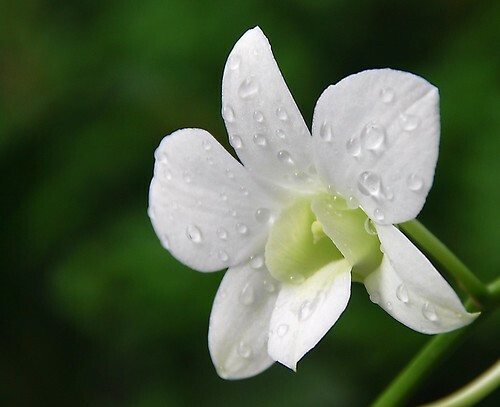 This white orchid photo was taken in Orchid Garden, which is located in Botanic Garden, Singapore. I went there in late 2008. I still remember that I went there with a girl who always loves to be a model in front of camera. You may have a question, is there anyone who wants to be model behind the camera? No… I mean she will immediately change her position and poses nicely if she was pointed by a camera. On that day she called me up to go out to take some photos because she has to update her Facebook photos or something like that. These days, there are a lot of Burmese model wannabe and photographer wannabe in Facebook. It’s nothing wrong. Technology changed the way we work, play and learn. Interesting! I am browsing my old photos and found this one. I am inspired by Albert who took very nice macro photos. As I am busy to go out for photo shooting these days, I posted the photo here. Hope you guys are not bored with it. Love this macro shot! I can see the water drops!